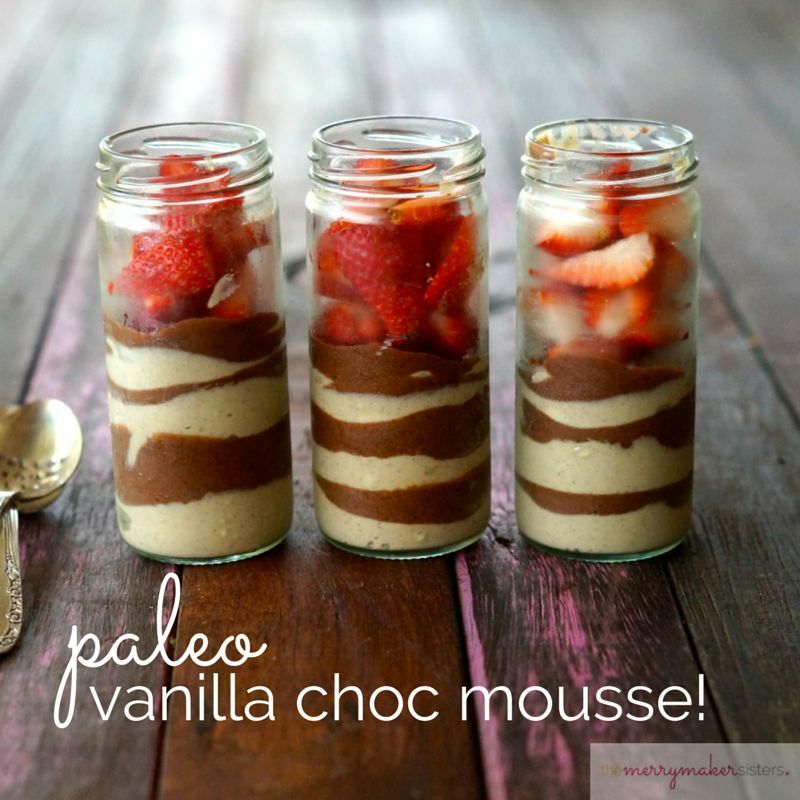 Paleo Vanilla Choc Mousse! The BEST Paleo Valentines Day Dessert to Make for Your Lover or Yourself. We Vote Yourself. It’s Valentines week! Are you loved up? We hope so because you deserve it (times a billion trillion). We don’t really mind if it’s in a loved up boyfriend/girlfriend/wife/husband situation or if it’s in an ‘I COMPLETELY AND PROFOUNDLY ACCEPT AND LOVE MYSELF’ sense. All we know is that we want it to be a positive love. A love that makes you feel amazing at least 99.9% of the time. The other .1% happiness will come from this Paleo Vanilla Choc Mousse! It’s the perfect Paleo Valentines Day Dessert! This amazing Valentines Day Dessert recipe features deliciously healthy ingredients. Coconut milk, cashews, Heilala Vanilla (no hidden nasties! ), cacao and a few other yummies too! Super simple to make and completely drool worthy. Impress your lover, impress yourself! We’d love to see pictures of your Paleo Valentines Day treats on social media tag #themerrymakersisters so we see them on Instagram! Or visit our Facebook page and post them to our wall! Always merrymaking and sending you HUGE love! In a food processor or high power blender (we use our Vitamix) whiz the cashew, coconut milk and coconut oil until smooth. Add the Heilala vanilla and coconut sugar and whiz til well combined. 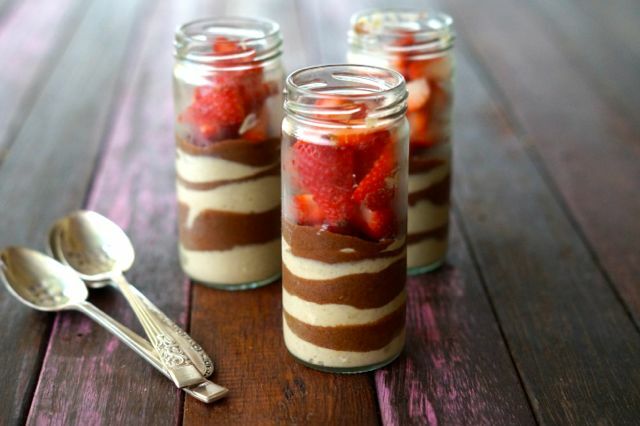 Get 4 cute jars or glass bowls and pour or spoon in the first layer of vanilla mousse. Place these jars into the fridge. Place the vanilla filling aside. Place all the ingredients in to the food processor (don't worry about washing the excess vanilla mix, ain't nobody got time for that!). Whiz until super smooth. The friction from the blending with allow the chocolate to melt and combine together. Get your jars out of the fridge and pour or spoon in the first chocolate layer. Place back in to the fridge for a couple minutes to allow the chocolate to firm up a little. Continue this method with alternating layers of choc and vanilla until you have used all the mixture. Top with chopped strawberries, if your jars are too small, serve the strawberries on the side. Place the jars in to the fridge for at least an hour or prepare the day before and leave overnight. Take out of the fridge at least 20 mins before serving as the choccy layer will be a little hard. If the whole layering thing seems a bit annoying just do 2 layers of vanilla and 1 of chocolate OR get a large glass bowl/dish and do one big Vanilla Choc Mousse cake and spoon it out like delicious icecream. *Sending huge virtual hugs and high fives to our recipe sponsor Heilala Vanilla.